The Michigan Natural Resources Commission recently honored longtime conservationist and Upper Peninsula native Tony Demboski with the Thomas L. Washington Lifetime Commitment to Conservation Award. The award was presented Thursday at the commission’s regular monthly meeting in Lansing. Demboski has been a voice for sportsmen and women in the U.P. for decades. Originally from Iron River, he has lived in Dickinson County for the past 38 years, currently residing in Quinnesec. His passion for natural resources has led to his involvement in numerous outdoor recreation-focused organizations, including U.P. Whitetails Association of Dickinson County. A member for 29 years and a past president, Demboski works tirelessly to build and improve relationships – including with the Department of Natural Resources. With his leadership in the organization, Dickinson County gained five walking trails, with completion of a sixth expected next year. The organization also established four annual scholarships totaling $8,000 for high school students in the county. Demboski’s leadership and energy have been far reaching. As a member of the Upper Peninsula Sportsmen’s Alliance, and president for the past seven years, Demboski was quick to engage in the fight against chronic wasting disease in Michigan’s deer population. The alliance facilitated a proactive approach to CWD in the U.P., hatching an idea that led to the creation of the U.P. CWD Task Force in November 2017, before there was a confirmed CWD-positive deer in the U.P. Demboski serves on the task force. The task force is led by NRC Commissioner J.R. Richardson of Ontonagon, who nominated Demboski for the award. "It's an honor to present this award to Tony in appreciation for his commitment and dedication to Michigan's natural resources,” Richardson said. “His positive, can-do attitude and energy have made Michigan's U.P. sportsmen's and women's voices heard in Lansing. He will have an everlasting fingerprint on our state's natural resources." Another example of the partnership between Demboski and Richardson is the creation of the Upper Peninsula Habitat Workgroup in 2014. This effort brought together state and federal government agencies, private landowners, conservation districts and businesses for conversations about landscape projects to improve deer habitat and game areas. This partnership resulted in funding from organizations and grant funding that soon will total more than $150,000 for habitat improvement on the ground and data analysis of critical deer wintering range areas. In addition to his participation in the Bear Forum, the Michigan Sportsmen’s Caucus Advisory Council, U.P. Bear Houndsmen Association, Michigan Hunting Dog Federation, United Sportsmen’s Club, Sagola Township Sportsmen’s Club and Sportsman’s Off-road Vehicle Association, Demboski also has directly influenced the lives of many U.P. youth. For the past 16 years, he has taught hunter safety courses, introducing youth (and some adults) to the experience of hunting. This is one of his top priorities. It’s the way Demboski was raised, and he enjoys sharing that passion with others. After spending his youth in the Upper Peninsula, Demboski enlisted in the Air Force, serving his country for 20 years before retiring as a master sergeant in 1977. A Vietnam veteran, he received four medals during his career for outstanding duty performance. After returning home, he worked as the Iron Mountain branch manager of AutoGlass Specialists, receiving the Manager of the Year Award and the Branch of the Year Award. He was promoted to supervisor for the state of Michigan, covering a span from Iron Mountain to Grand Rapids and beyond before his retirement. Throughout this time, and continuing today, Demboski has taken up the charge to improve conservation and outdoor recreation in the Upper Peninsula, forming partnerships and forging relationships that have been instrumental in benefiting natural resources and those who enjoy the outdoors. 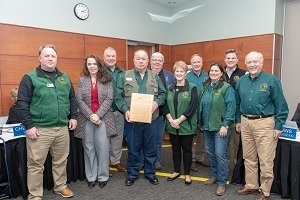 The conservation award is named for Thomas L. Washington, past director of the Michigan United Conservation Clubs and a giant in Michigan conservation. During his life, Washington helped build coalitions of conservationists and environmentalists to achieve landmark initiatives that benefit Michigan residents to this day. Nominations are submitted for consideration by a member of the NRC and chosen by the NRC in consultation with the DNR director. For more information about the Natural Resources Commission, visit michigan.gov/nrc. /Note to editors: Accompanying photos are available below for download. Caption information follows.